Can libdvdcss Help Rip All DVDs on macOS Sierra (or Above) along with HandBrake? Note: Starting from macOS Sierra, the rootless mode can be disabled to have user modify the existing system directories via complicated settings. And HandBrake does not have ability to rip copy protected DVDs unless with the aid of libdvdcss, a library file that's developed by VideoLAN to decrypt and access some copy protected DVDs. 1. Replace the libdvdcss file into /usr/local/lib (from /Library/SystemMigration/History/Migration-some-gibberish/QuarantineRoot/usr). Create a lib folder if there's no before. 2. Copy the libdvdcss and install it with macOS package manager Homebrew. So, HandBrake + libdvdcss only handle DVDs copy protected by easy CSS, DVD region on Sierra. How about converting DVDs encrypted with other techs lik UOP, Sony's ARccOS and Disney's unnamed DRM program? Well, only a DVD ripping whiz is competent at this job. ● [No libdvdcss or so third-party helper needed] Independently rip protected DVD movies on Sierra or lower. ● Be continuously updated to override all of the newly-merging DVD copy protections. ● Bring zero harm to your Mac computer for containing no malware, spyware, virus etc. HandBrake only works for a fraction of encrypted DVDs with libdvdcss on Sierra (See How HandBrake Rips Encrypted DVDs). And it is quite time-wasting to do the download-install or copy-paste thing in specific path about libdvdcss if you're a green hand on computing. So finding a closest and slickest HandBrake libdvdcss alternative for easy-peasy DVD ripping on macOS Sierra helps a lot. 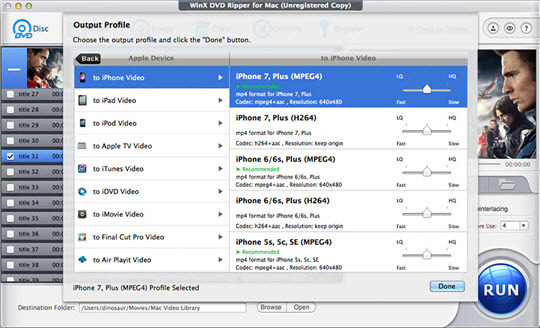 ↓Download suitable WinX DVD Ripper for Mac now to convert or backup DVD right now. ● Rip DVD to specific video formats that can be selected in General Profiles, Web Video Profile and Common Video/Music Profile, like MP4, MOV, M4V, AVI, WMV, MPEG, FLV, TV video and music types. ● Rip DVD to your mobiles under Mobile Video Profile. Here hundreds of new and classic phones, tablets, ultrabooks and game consoles are included, for example iPhone 7, Samsung Galaxy and Sony PSP. ● Backup DVD content with no compression at DVD Backup Profile. No matter whether you want to copy the full DVD movie title (to MPG/MKV) with all audios, videos and subtitles, or copy the main title, this HandBrake libdvdcss alternative for macOS Sierra can finish the task smarty. Step 3 - Press "RUN" to begin DVD ripping. And kindly to warm you that this Mac DVD ripper defautly selected the movie's main title, so you needn't do anything when facing numbers of titles listed here but do remember to check "Safe Mode" to insure a 200% successful DVD ripping process. Plus, Sierra HandBrake replacer gives you edit and setting options to do some advanced and personalized settings about your output DVD video. Just explore them by yourself if you have expertise about video parameters. - Download VLC video player for Mac (if you have real needs), and the libdvdcss can be found in its installation folder. - temporarily go over Gatekeper by: right clicking HandBrake -> Open -> confirm to "Open" this app. - or disable Gatekeper in macOS Sierra by do the settings: System Preferences > Security & Privacy > General -> Allow apps downloaded from: Anywhere. Want to decrypt and rip DVDs fast and with no error on macOS Sierra or lower versions, just free donwload and try WinX DVD Ripper for Mac. During the using, if you have any question on how to use macOS (Sierra, High Sierra, Mojave) libdvdcss alternative to rip DVD or fix HandBrake not working on ripping copy protected DVDs, please feel free to Email Us.